The BMW X6 M combines M typical performance with the flexibility of an X model. A spirited M TwinPower Turbo V8 petrol engine and eight-speed M Steptronic transmission take driving pleasure to the extreme. Standard 20-inch or optional 21-inch light alloy wheels and the powerful design of the front and rear aprons guarantee a commanding presence. 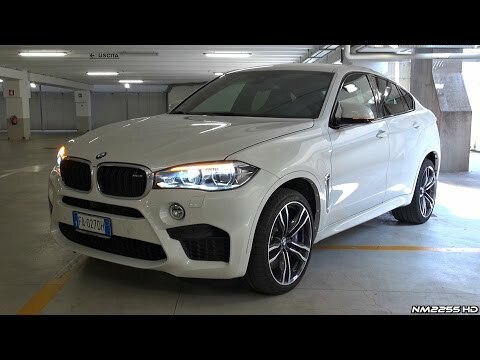 THE BMW X6 M IN MORE DETAIL. Rapid gear changes, either manually or automatically, are possible thanks to the standard-feature eight-speed M Steptronic transmission. The M compound brakes achieve outstanding, motorsport-like deceleration values, and BMW EfficientDynamics technologies ensure that the awesome performance is combined with remarkable efficiency. In BMW M vehicles, xDrive places more emphasis on the rear axle, which also contributes to advancing dynamic characteristics. Priority is given to directing power to the rear wheels, and then to the front wheels, especially when driving through curves, minimising the tendency to understeer. This means that the driver can accelerate earlier and more forcefully, fully enjoying the vehicle's high driving dynamic potential. If desired, the front axle can receive up to 50 percent more of the drive torque. When Dynamic Stability Control is fully deactivated, controlled drifts are even possible. This Sport Activity Coupe is built for top performance, with a majestic flair. Equipped to master any number of different challenges and always on the look out for tight bends and new routes off the beaten track. A unique combination: comfortable the moment you get in, and incredibly powerful the moment you touch the accelerator pedal. The front of the car is dominated by commanding air inlets and a wide M double-bridge kidney grille, which hint at the vehicle’s enormous potential. Rounded off by striking headlights, the dynamic character is further emphasised by a coupé-like silhouette, M side skirts and a two-part crease line. From the moment you see the interior of the BMW X6 M, something becomes clear: It’s not merely a driving seat that awaits, but a cockpit that has been developed for top sporting performance. The optional M multifunctional seats with high side bolsters make you want to immediately seek out the next tight bend. Take the wheel of the outstanding BMW X6M and experience it for yourself. With over 100-years of refining, every BMW model has been crafted to deliver pure driving pleasure. There has never been a more exciting time to drive the open road. Official fuel economy figures for the BMW M Series range: Extra Urban: 26.2 - 42.2 mpg Urban: 14.6 - 25.4 mpg Combined: 20.3 - 34.0 mpg CO2 emissions 325 - 194g/km. Figures may vary depending on driving style and conditions.Test drive subject to applicant status and availability.